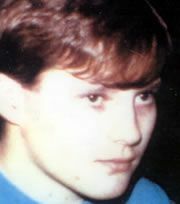 'Outgoing' and 'very popular' Carl Lewis travelled to Sheffield with his two brothers - Michael and David - and friends, including Paul Carlile, who also died in the disaster. The father-of-one from Liverpool was set to start a factory job on April 17. Margaret Lewis, Carl's mother, said: "He has nieces and nephews who never met him, but they all know about that dreadful day and they love and miss him just the same." When a woman loses her husband, she becomes a widow, and when a man loses his wife, he becomes a widower. When a mother loses her child, there are no words for this. This is because it is not the natural order of things. No parent should ever feel the grief and emotion that comes with losing a child, a child that you created and cherished unconditionally since the day you first set eyes on him. My son, Carl David Lewis, was born on May 4, 1970. He was our first-born son. Michael, my husband, and I were over the moon when he was born. We were young and full of plans and dreams for our family. Soon afterwards, we had another addition to our family, our son, Michael, and within another year we had another son called David. Michael and I could not quite believe we had three little sons all under the age of three. I was a very busy mum, but I loved my role. Our home was always full with the sound of joy and happy, healthy children. We were so blessed. Our family was complete. Carl never gave us any real cause for concern throughout his life. He was a good boy. When he was a baby, his personality was easy and he had a beautiful smile. My three sons, as well as being brothers, were great pals. They would play happily for hours and then suddenly all hell would break loose and an argument would start over a game or who had taken somebody else's toy. They usually sorted it out between them. Carl was always often the peacemaker when they had these rows. Carl enjoyed school. He went to St Michael's Roman Catholic Primary School and then on to St Kevin's Secondary School. He never had any problems at school. He was very outgoing and was very popular, with many friends. Carl decided that he would not continue school, but, instead, would leave school and learn a trade. At the age of 16, he became an apprentice bricklayer. He did not enjoy this at all and looked around for another job. Eventually, Carl got a job in a chicken factory, and he absolutely loved it. He was popular with all the workforce there. He spoke so highly of the job that he got his two brothers, Michael and David, to join him working at the factory. I am not sure if Michael and David liked this job as much as Carl, but he genuinely loved the people and the job. Then, out of the blue, they were made redundant. Carl was really upset, but he immediately got a job working as a scaffolder. He was not too keen on the job, but he continued with it so that he was not out of work. Unexpectedly, Carl received a letter from the chicken factory asking if he would like to return to the job as they were taking people back on. Carl was made up. He was so happy and looking forward to returning to the job. He was due to start back at the chicken factory on April 17, 1989. Carl started a relationship with Paula when he was around the age of 16. When he told us Paula was pregnant, we were surprised, to say the least. Paula and Carl both continued to live at home. Their beautiful daughter, Chantelle, my first grandchild, was born on April 26, 1988. She was just 11 months old when Carl was taken so cruelly from us. Every day Paula and baby Chantelle would come to our house just before Carl would get home from work and they would spend the evening with us. They practically lived with us. Carl would come into the house and Chantelle's smile would light up the room. He liked nothing better than getting paid on a Friday night and taking Paula out while Chantelle remained with us. Carl loved to look good. His clothes, he loved his clothes and would ask his dad to iron his shirts for him and would offer to pay him money. He always looked really smart when he was going out. My husband, being a Liverpudlian, was also a great supporter of Liverpool Football Club. We did not have much money. Michael, my husband, could not afford to go to the matches, but he always made sure the boys had enough money to go and watch Liverpool play. Carl so enjoyed going to watch Liverpool play. He went to all the Liverpool games with his closest friends. On that awful day, Carl was at the match with his two brothers and also his friend, Paul Carlile, who also died. The death of Carl was so unexpected, so sudden and so cruel. The grief tore my family apart. David and Michael struggled to cope with the loss of Carl, but thankfully they have both got their lives together and I am so proud of both of them. Michael, my husband, never recovered from the loss of our first-born son Carl, and he died four years ago at the age of just 58. I often sit and wonder, what if? Carl would be 43 years old now. He has nieces and nephews who never met him, but they all know about that dreadful day and they love and miss him just the same.